A relatively clean water source, groundwater is found beneath the ground surface, protected from contamination. Most of the world’s available fresh water is found underground. 1. Of all the water in the world, approximately 97% is found in the oceans and seas as salt water. 2. Only the remaining 3% is fresh water. 3. 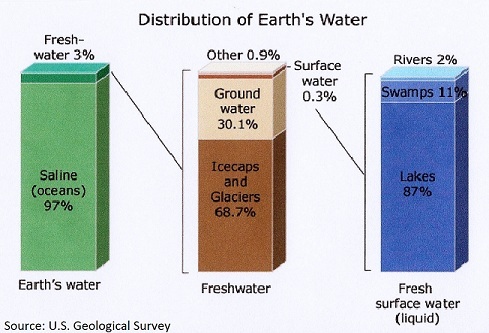 Of the world’s fresh water, 69% is locked up as ice in glaciers and icecaps. 4. 30% of the world’s fresh water exists underground as groundwater. 5. A small amount (less than 1% of earth’s water) is available as surface water in rivers, streams and lakes. So, groundwater is a major clean water source. The National Ground Water Association has found that 49% of the U.S. population depends on groundwater for its drinking water supply, from either a public source or a private well. Worldwide, groundwater systems provide 25% to 40% of all drinking water. To define and describe groundwater, we must start with the Water Cycleand the continuous movement of water on, above and below the surface of the Earth. Groundwater sources are found within certain layers underground called “aquifers”. The various strata of soil, sand, and gravel found underground filter out most disease-causing organisms and harmful chemicals as the water infiltrates through them. This is why groundwater can be considered a clean water source. Locating groundwater can be accomplished through simple observation, examination, and inquiry or by more expensive and complex geophysical methods. The objective of any of these methods is to give the well driller some understanding of what is going on underground; the depth and location of aquifers, direction of flow, and relative position to possible sources of contamination. The method used to drill for water depends upon many factors (economics, methods available, etc.) but the most important factors might be the kind of material that must be drilled through to reach a clean water source and the depth that must be drilled to reach it. Methods for drilling run the gamut from low tech to high tech. Manual methods such as those used for making hand dug wells , require little technology but lots of manpower. Large, technical drill rigs used to drill a water well are expensive and automated. Training, safety, practice and patience are all important in every drilling endeavor, no matter what the method. Finding the best well site location requires at least a basic knowledge of hydrogeology and other factors, as well. Proper well construction, pump construction, pump installation, and well development are critical since our goal in drilling is not simply to find an accessible source of water. We need a source that will provide safe and clean water, in useable quantities, that can be maintained for years to come. Check out this water well diagram and the components of a properly constructed well, including a properly constructed pump pad,and basic principles of working with concrete. No matter what method is used to reach groundwater, once the water is there and the well is completed, well disinfection and well development are necessary. 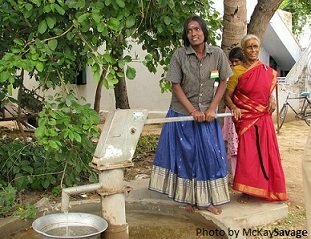 Well disinfection will make the well water safe to drink and free from disease-causing microorganisms. Subsequent treatment of the water collected from the well is always recommended even after well sanitizing. A properly constructed and sanitized water well, however, provides a safe and protected water source for the community to use for a long time. Return to "Home" from "Clean Water Source"